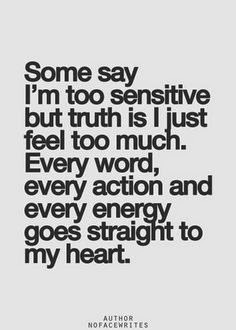 It's taken me till a few months ago, till over the age of 40, to realise that I am an empath. It's not an easy road to travel. If you are reading this post, then there's a chance you may be one too. 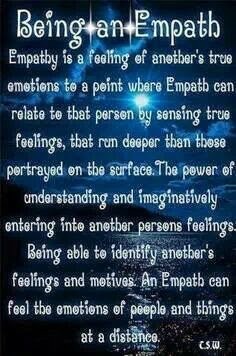 So what does it take to be an empath?. 1. You sigh, I sigh too. So we're in a room together. I am washing the dishes and listening to the radio. I am in a good mood. Life is good, and you sigh. I don't just HEAR it, I feel it, and until I know what it means, I can't shake it off. If I ask you what's wrong, and your answer does not equate to what I am FEELING, then it leaves me troubled. It's NOT easy. So I meet you, and I sense that the smile on your face is not connected to your eyes. I sense that what I am seeing with my eyes and hearing with my ears is not the real you. Our communication won't be authentic. I walk away. You want me to be all things to all people. So we meet, you think I will lift you up. You realise that your inner troubles and conflicts are mirrored in the projection my spirit shines back at you. You realise that our conversation WILL be authentic. This time it is YOU who walks away. You are Clairaudient= hearing things beyond normal. I saw this shared on Facebook: "Empath Lifestyle"
I've wanted to write this post for a long time, but seeing Ruth's post about Living and Loving as An Introvert at Dorky Mum galvanised my decision to, but the next bit is part of how introverts and empaths are so very different. Empaths need time alone with almost no external input. So for me the alone time is nothing to do with being an introvert and EVERYTHING to do with needing to recharge. I always had my hand up in class. At every career "job" I have ever had, I always knew all the answers. The fact that I got good grades, without studying, drove my Mum potty. She said it will make you lazy in the future (she was right). In fact my A-level results made her cry. Sorry Mum, but this is me! In fact I will hit PAUSE now so you can go and read the rest of WikiHow: If You Are am Empath as it is ALL relevant. I would say that the "tips" section there is even better than the "Finding Ways to Survive and Thrive" section. I know if you've been talking about me. It's like it's tattooed to your forehead and I guess energetically it kind of IS! and it only serves to amplify it all. Add to my need for empath solitude that actually I am an extrovert and am therefore drawn to the very large crowds that kill me off, then it's a recipe for why I am in the state I am. This video, finally explains it very very well. Enjoy!